We’d love your help. 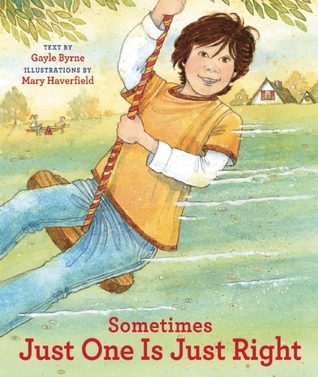 Let us know what’s wrong with this preview of Sometimes Just One is Just Right by Gayle Byrne. To ask other readers questions about Sometimes Just One is Just Right, please sign up. A very good picture book about being an only child. This is a good book for kids with or without siblings. The family structure is traditional, one mom, one dad, and a child. The main character talks about why he wishes he had siblings sometimes, and his cousin tells him why he wishes he was an only child at times. I didn't find any great meaning to this book, mostly just a feel good story about a boy who wants someone to play with. A part of me does wish that they had gotten a bit more into his friend's Lily's situation. There is only one mention of her in the book. She seems to be an only child, living with a single mother. The narrator spends so much time comparing his own situation to his cousin Nico's, that it feels like Lily is a bit shafted or almost unnecessary to the story. Other than that little blip that threw me off a tad, I really did like this book. I have some "onlys" in my life who would have appreciated this book when they were younger! This is such a positive story! It focuses on all the great perks of being an only child, while portraying families of all sizes in an equally favorable light. The story acknowledges the occasional "grass is always greener" mentality and the loneliness only children sometimes experience. The narrator has a cheerful perspective which helps him work through those feelings, and that isn't going to be lost on children who read the book. My 4-year-old found the illustrations very exciting. She was drawn to the many details on each page and wanted to talk about everything she noticed. Everything. Because of that, we ended up looking through the book first, and then reading it! She also seemed to relate to the story itself, pointing out that she's had experiences similar to the narrator. In the midst of a multitude of books about the arrival of a new brother or sister, Sometimes Just One Is Just Right fills a much-needed gap by addressing the concerns most common to only children, while always maintaining a heartening, upbeat tone. The Three Dog Night song. "One is the loneliest number that you'll ever do," ain't necessarily so. Being the only child in the household can have its advantages... like being the middle of a cuddle sandwich between mom and dad on a lazy Saturday morning while in bed, or getting to have the red bowl and cup everyday....just because you want to and no on else is fighting for it. The remote control? Yep, it's all mine to flick and change channels and enjoy whenever I want. I am always the centre of The Three Dog Night song. "One is the loneliest number that you'll ever do," ain't necessarily so. Being the only child in the household can have its advantages... like being the middle of a cuddle sandwich between mom and dad on a lazy Saturday morning while in bed, or getting to have the red bowl and cup everyday....just because you want to and no on else is fighting for it. The remote control? Yep, it's all mine to flick and change channels and enjoy whenever I want. I am always the centre of attention...always... and the adults love to include me in whatever they are doing too! I was immediately attracted to this book because of it's beautifully illustrated cover & title. I was granted a copy from NetGalley for review. I loved it. At times I was an only child and my son is also an only child with a half brother visiting regularly. I could relate to the book myself & so could my son. The book is a wonderful story that highlights the benefits if being the only child even though it is often boring and lonely. My son has asked us to adopt a boy his age so he'd have I was immediately attracted to this book because of it's beautifully illustrated cover & title. I was granted a copy from NetGalley for review. I loved it. At times I was an only child and my son is also an only child with a half brother visiting regularly. I could relate to the book myself & so could my son. The book is a wonderful story that highlights the benefits if being the only child even though it is often boring and lonely. My son has asked us to adopt a boy his age so he'd have a brother his age to play with. Haha. My son, as well as many only children do not realize that families with multiple children aren't necessarily better. A lovely picture-book about how being an only child can be a pretty awesome thing. This is such a positive story! It focuses on all the great perks of being an only child, such as being in the middle of a cuddle sandwich or getting to have the red bowl and cup every day. I like how this book shows the main character's friend with a big family as well as his own only child-ness, and how there's good and not-so-good in both. It acknowledges the occasional "grass is always greener" idea and the lon A lovely picture-book about how being an only child can be a pretty awesome thing. This is such a positive story! It focuses on all the great perks of being an only child, such as being in the middle of a cuddle sandwich or getting to have the red bowl and cup every day. I like how this book shows the main character's friend with a big family as well as his own only child-ness, and how there's good and not-so-good in both. It acknowledges the occasional "grass is always greener" idea and the loneliness only children sometimes experience. The narrator has a cheerful perspective which helps him work through those feelings, and that isn't going to be lost on children who read the book. This story does a nice job of showing the benefits of having siblings (someone to play with, talk with etc.) but also the benefits of having your own space and ability to be alone. It is gorgeously illustrated! This is such a cute story, and in a world where books prepare children to welcome a new sibling to the family, a book that demonstrates the benefits of being an only child is a great addition. I requested a review copy of this book to read to my daughter, who is only 1 so obviously she doesn't understand it yet. However it was a nice book for my husband and I to read, since as parents, we are always on the fence about whether we should have another child so our daughter has a playmate and compani This is such a cute story, and in a world where books prepare children to welcome a new sibling to the family, a book that demonstrates the benefits of being an only child is a great addition. I requested a review copy of this book to read to my daughter, who is only 1 so obviously she doesn't understand it yet. However it was a nice book for my husband and I to read, since as parents, we are always on the fence about whether we should have another child so our daughter has a playmate and companion, or if we should just stop now that we have her. This book presented the advantages and disadvantages of both cases, and the narrator had a positive outlook as he compared his situation to the situation of others. I saw something about Sometimes Just One Is Just Right recently, and I knew I had to read it with Christopher. It's about a boy who wishes he had siblings. It was good to talk with Christopher about whether he wished he had siblings - he used to. Now he told me that he likes being an only child because then he doesn't have to share. I think we work well as a family of three, so it was nice to hear that he agrees. I read this book to him because I really wanted to read and discuss it. I did make h I saw something about Sometimes Just One Is Just Right recently, and I knew I had to read it with Christopher. It's about a boy who wishes he had siblings. It was good to talk with Christopher about whether he wished he had siblings - he used to. Now he told me that he likes being an only child because then he doesn't have to share. I think we work well as a family of three, so it was nice to hear that he agrees. I read this book to him because I really wanted to read and discuss it. I did make him read the first page though because he needed another 2 minutes for his 15 minutes that night. Gorgeously illustrated! A lovely picture-book about how being an only child can be a pretty awesome thing. I'm an only child and I'd have loved a book like this when I was little, instead I got my fill of the "older sibling prepares for the new baby" stories! Which of course I loved, but they made ME want a sibling. I like how this book shows the main character's friend with a big family as well as his own only child-ness, and how there's good and not-so-good in both. This is a sweet story depicting the positives of be an only child. The illustrations are delightful. The story depicts many different types of families, showing the diversity of our world. As only children grow up it is only natural for them to wonder what it would be like to have siblings. This story does a nice job of showing the benefits of having siblings (someone to play with, talk with etc.) but also the benefits of having your own space and ability to be alone. A cute book for only children, highlighting the benefits of being "just one." The illustrations are well-done and, in my opinion, superior to the text itself. I was a bit confused by the mention of the friend Lily, as she's only shown once, whereas the cousin Nico is shown more than once. It would have been better if Lily had either been shown more often or if she hadn't been included at all. Note: I received a digital copy of this book through NetGalley. a touching story of an only child, showing both the good and the bad, but in the end... sometimes just one is just right. I'll be keeping this one on hand for my little boy as he gets little older and realises he is just one, but he is just right! and I hope this book will help him to understand and accept that. ** thanks to NetGalley & the publishers for this copy! I read this to my grandson, he enjoyed the story. The story relates the good and bad of being an only child. Sometimes having siblings is good and sometimes it is just fine to be an only child. It is different for every family. I received this book from netgalley. This is a delightful story about being an only child. The author highlights all the good stuff about having siblings and the good stuff about being an only child. I also like how she has depicted all kinds of family from a one child/parent home to a large family. Nice pics too. This picture book explores the benefits and drawbacks of being an only child. It is refreshing to have this topic covered amidst the numerous books dealing with new babies and sibling rivalry. this book is cute. it tells the ups and downs of being an only child. i just found it a little dull and lifeless. "Only" doesn't have to mean lonely! Cute book for only children who are exploring how their lives are different from those they know with siblings. A cat and squirrel are on many but not all pages. About different kinds of families, with an emphasis on being an only child. Perfect for families with an only child. A very relateable book told from the child's perspective.